Upload beautiful images of your menu items, with titles and descriptions. Add tags to help spooners with specific or dietary preferences find your dishes (ie, healthy, vegetarian, gluten-free, etc.). Preview your dish before you publish it. Save time by creating dish posts once and recycle forever for future scheduling. Moving target? No problem. 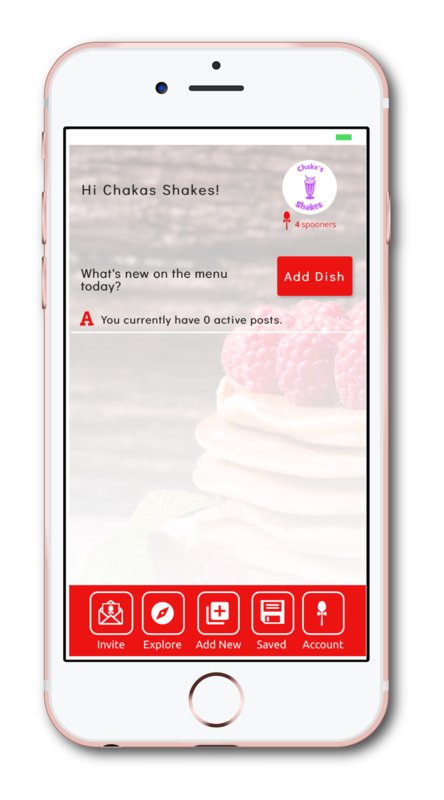 Instantly let Spooners know where you are and what you're serving. Once your menu items are uploaded. Select the items you are going to offer for this service. Let your phone GPS ping your exact location or manually enter an address. Tell Spooners how long you will be at this location. Go Live! and make all your dishes searchable to existing AND new Spooners. Your dishes selected will automatically deactivate at your scheduled time, unless you end the session earlier. Menu change from breakfast to lunch to dinner? No problem. Select the items that you want to feature today to Spooners. Schedule the meal times that they will be available for. Add or cancel scheduled items as needed throughout the day. Let dishes expire from search automatically, according to your set business hours.